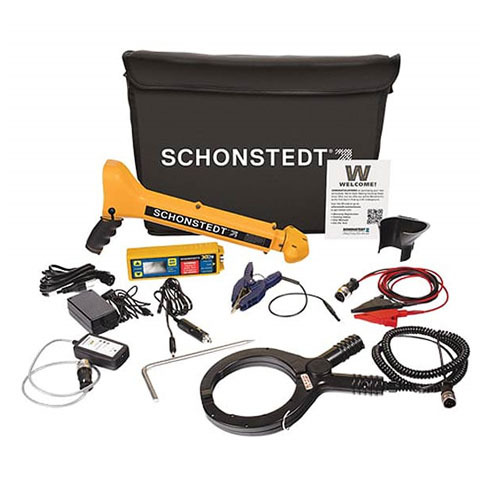 The Schonstedt CL300 Pipe and Cable Locating Kit consists of a portable, holstered pipe and cable locator with an industry accepted 33kHz transmitted frequency. It comes standard with 512 Hz detection capability. With an added 512Hz transmitted device or traceable duct rodder the CL300 becomes the perfect tool for empty duct work locating. This instrument is capable of detecting all electrical, telecommunications and wire circuits whether direct buried cables or those within conduits using direct connect or close induction methods. Auto and Manual adjustments for both transmitter power and receiver sensitivity to assist with a variety of locate work and congestion. Applications: Locate and trace the path for all electrical and telecommunication cables along with buried wire for pumps, irrigation or traffic control systems. The CL300 will also detect tracer wire buried alongside water/sewer or gas pipelines. In SONDE mode, this instrument will detect and pinpoint any device that transmits at a 512Hz frequency, such as an inspection camera, boring equipment or sonde. The CL300 is a great kit for utilities, construction companies and home service contractors needing to mark buried utilities for damage prevention, excavation and facilities maintenance.